Time for something different for a change. 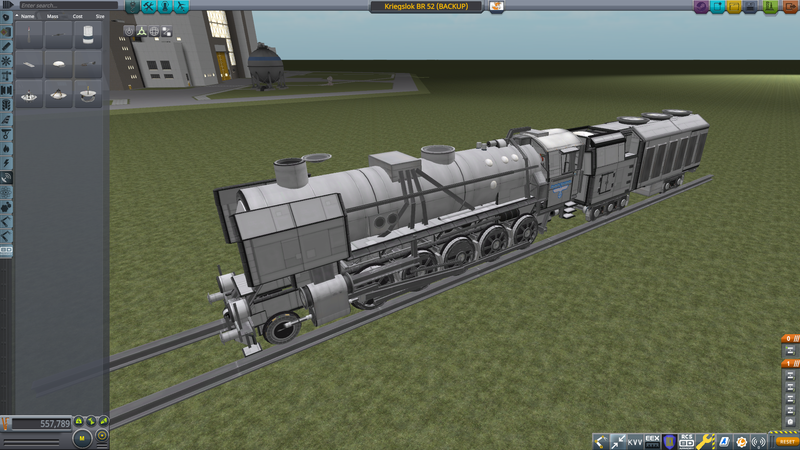 While im waiting for the 1/72 HobbyBoss model of this train to arrive, i taught id have some fun and replicate it in KSP, as i have for a pretty long time wanted to make some sort of a train model, and i wanted to do something more relaxed to kill the time. So, as is explained on the title, this one is just a static display model, not a working one...so, expect a LOT of detail on this one. To ensure proper shots, all the picks are from the editor, with a couple KVV shot's showing the painted versions of it. 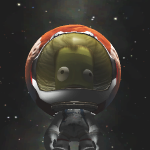 More details about engineering will be inside spoiler. I started the build by making a pair of wheels first. 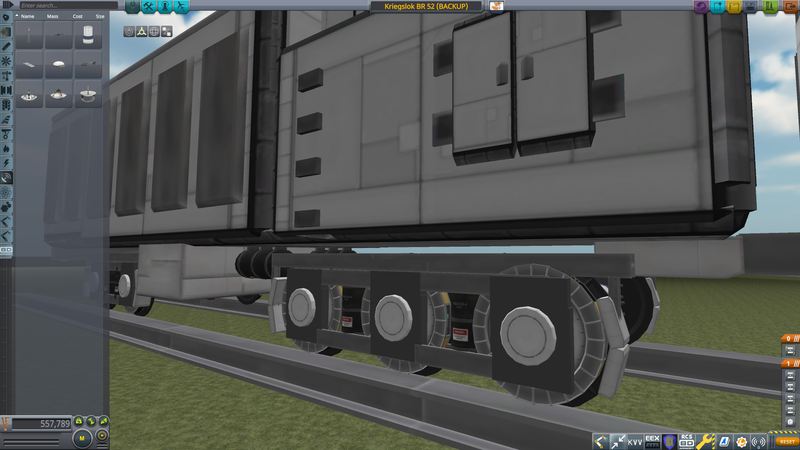 Then i multiplied them to create the main running wheels. The rest was easy to scale off of those. I do feel however that the boiler might have slightly too big of a radius and the locomotive is a little too stubby...but not too far off. The build went surprisingly smoothly and there weren't really any point's where i would have gotten stuck, other than the tenders bogeys witch i built last to give myself sometime to think that how im gonna make em. 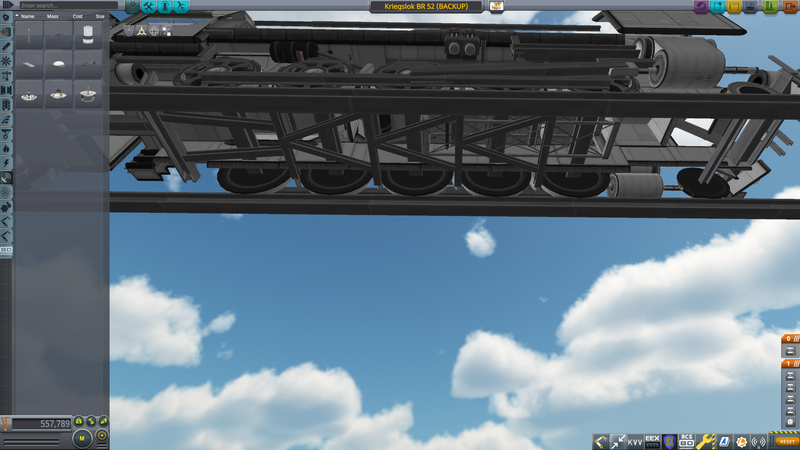 As i will later probably explain, i intentionally skimmed on some details to reduce part-count a bit, like the vent's on the tender for instance, i could have used a 100 I-beams to make the grills, but that would have been a bit too much if you ask me, so now their fuel-cell banks instead. 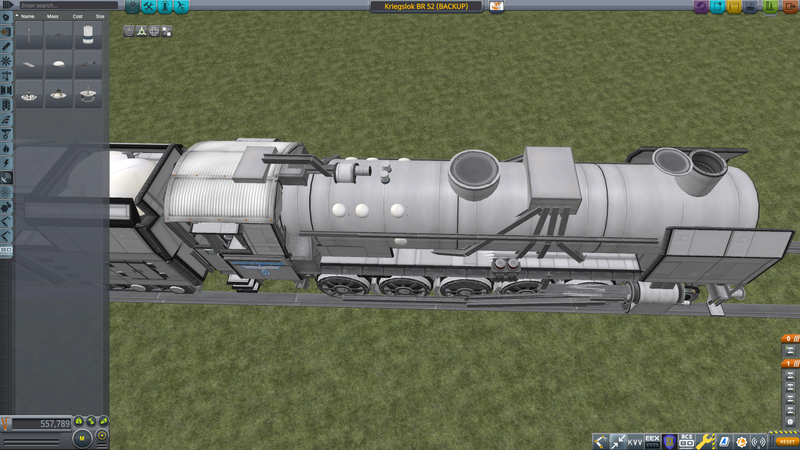 The locomotive is in no particular scale, i just chose the first part that fit and then worked my way from that. 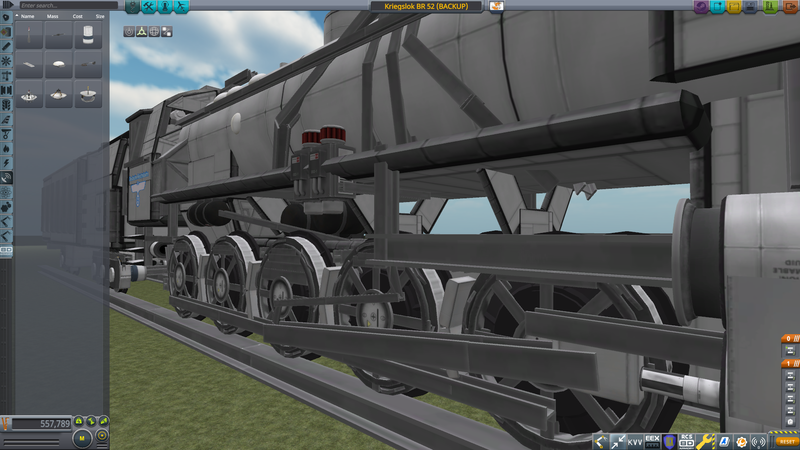 I could have possibly made this using less scaling by making the wheels from the bigger flat adapters. Yes, i did take care of censoring. Sorry about the blue outlines, dunno why Gimp decided to create those...probably cause i don't really know how to use it, but it doesn't really matter. 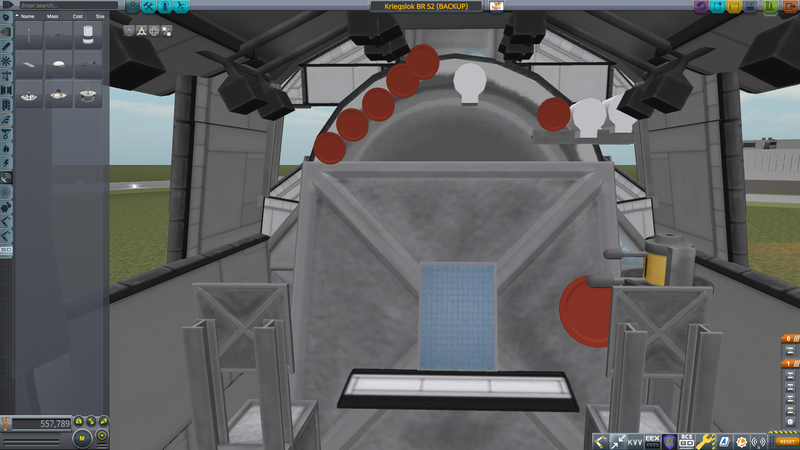 Got the idea of using the satellites as the coal load. 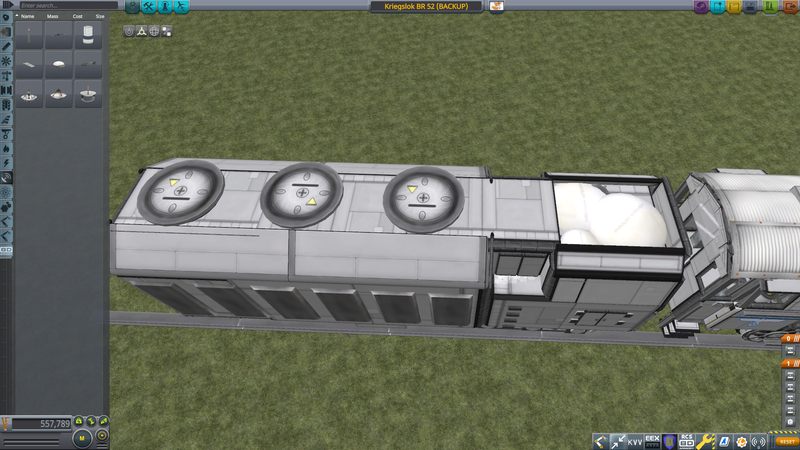 The big fans on the roof is another detail i could have made. Cab details are pretty minimal on this one. I reduced the amount of spokes on the wheels to reduce part-count. I tried to get all the details here, but it's really difficult to see all the details since it's usually pretty dark there, witch makes it seem very dense and crowded, while it's actually really empty in-between the boiler and the chassis. The underside shows the complete (simplified) brake-system. 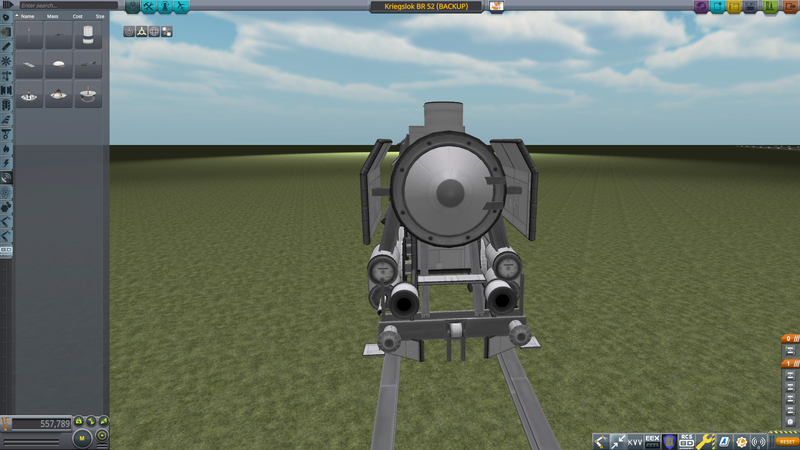 I was a bit confused at first that how i was gonna do the bogies, but i think they turned out pretty well. There was about 4 different choices of tenders for this, i chose the biggest one of them. I really liked the look of it, and it's also pretty close to a type of tender used in a German armored locomotive i have a paper-model of (it's propably a version of this very tender type, as the only real difference is that it is 6-axled. There is also a 4-axle version of this tender. Im guessing they probably added quite a few upgrades over time that added more and more weight). The first one is one of the many camo's these locomotives had. (sorry for the fuzzy reference images). There are some smaller details that are a little more...individual, so not all the details are from this very BR 52. The other one is the civilian livery, witch most will no doubt have seen on countless German steam-engines. (the "grills" on the tender should be black, but i decided it would look a little more interesting this way). Unfortunately as is common with these painting mods, not all parts could be painted. These are: Decouplers, cube cores, and the radial attachment nodes. And here is a reference pick that i used for making the tender. As i said above, these BR-52's have their differences. Tough in this case lack of some details has to do with the fact that this one is a Z-scale locomotive (1 below HO scale if remember correctly). Mods used: Tweackscale and DCK. And there it is for you, a fun little side-project to kill the time while i anxiously wait to get started on the model-kit version of this . I hope you enjoy it . PS: if you want to see picks of the model once i get it done, let me know in the comments, as id love to show it and some of the other bits from the diorama project this belongs to. Yeah but how much dV does it have? Is it also a submarine? Time for a little update/announcement. The BR-52 model just arrived and picked it up, and did some examination (if i already wouldn't have done a million google searches in excitement). And im gonna add a couple extra features on mine. 1. this is some thing that is already available as an expensive upgrade kit. Im gonna use some iron wire and some cocktail sticks to create some extra armor around the boiler. Basically it's just a bunch of stacked logs sitting on the platforms around the boiler. This where an image should have been, but Imgur decided to become an unresponsive carrot today. Sorry. 2. Im gonna do something a few modellers have already done, witch is adding an AA gun on the flat bit behind the tenders coal storage. I have a perfectly good Quad 20mm flak gun wainting to find it's place on the diorama. So, yes...i will be making a post about the model locomotive, and the rest of the diorama project. A link to see it will be added somewhere in this post, and vise versa. THAT is beautiful. I hope lots of people get to see this. I am very glad you shared this. Thanks . And im very glad people are liking this as much as they are, especially considering this thing never even left the hangar nor had any struts installed. Not that i really care about rep, but it does definetly help motivate me. @kapteenipirk This is amazing. 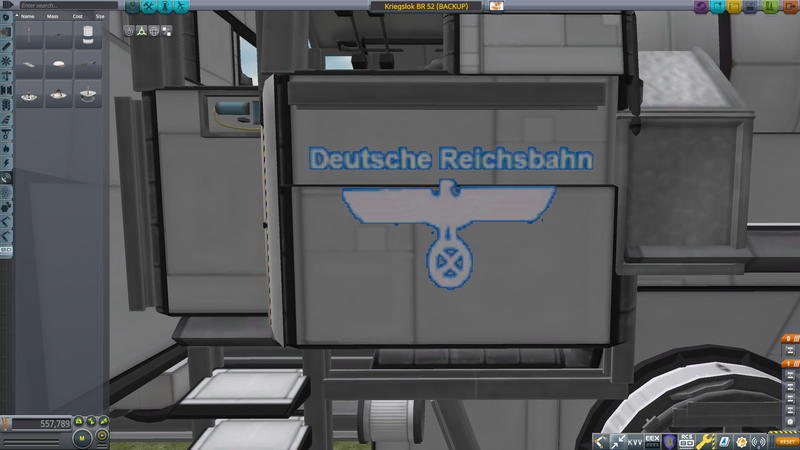 KSP’s a game about building rockets, but people build chessboards, cars, submarines, statues and even trains. Well done. Thanks . Yea, people have created some real crazy stuff in this game, but that's part of the fun, seeing if you can build something your not really supposed to . Alright, the model version of the BR-52 is done, and here is a link to the post i made about it, and the diorama it will be a part of.